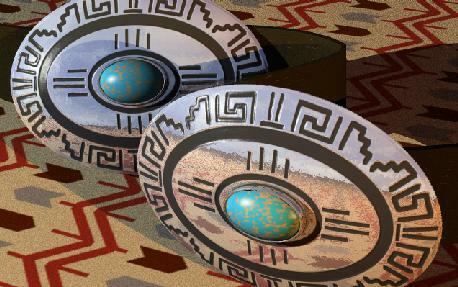 Here's a gallery of miscellaneous digital images, mostly 3-D renderings done for my own amusement with the cheap, powerful, and idiosyncratic Imagine modeling, rendering, and animation program, or the VistaPro 3-D landscape rendering program, or the Bryce 2 landscape rendering program, on either an Amiga 3000 or a PC, mostly back in the 1990s. 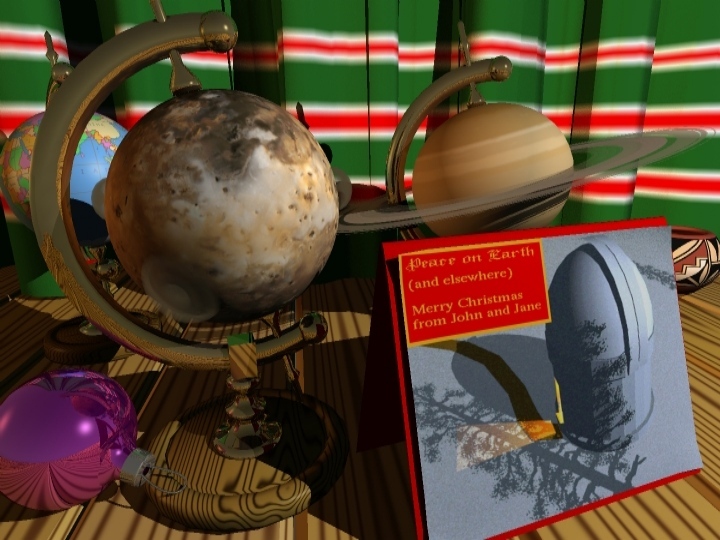 1997 Xmas contest mystery picture (75 K JPEG)- click on the thumbnail for the full sized version. Andy White, as the first Lowell person to figure out what this image represents, won a pair of movie ticket coupons for Harkins Theatres. Two non-Lowell people (Nick Schneider and Erica Ellingson) also figured it out. Clues, and wrong answers given here. And finally, the answer!- if you want to solve it for yourself, don't click here. Simulated Scottish Highlands scene (81K JPEG). 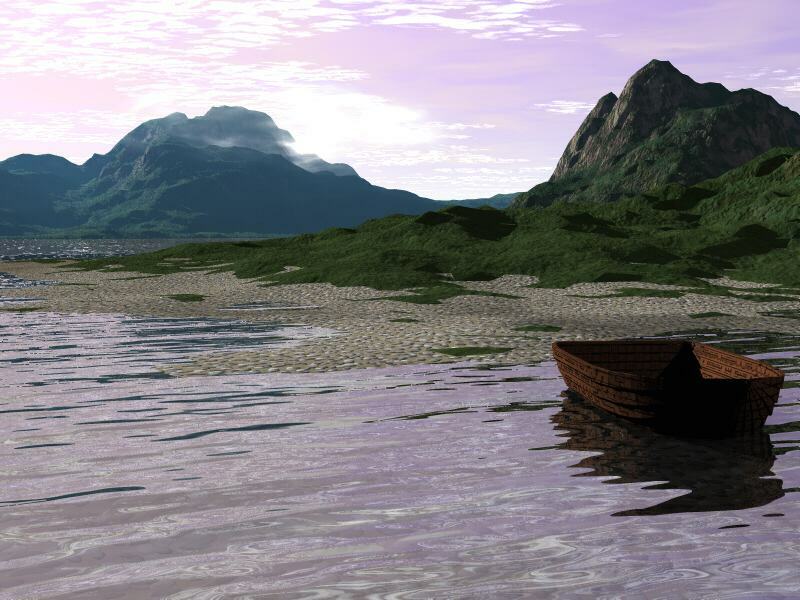 Bryce 2 rendering, with rowboat modeled in Imagine and imported as a DXF object. All my earliest Bryce scenes ended up looking like Lake Powell, so this was an attempt at a very different type of landscape. The pebbly shoreline was added using a trick, described here, that can be used to add shorelines or beaches to any Bryce landscape. 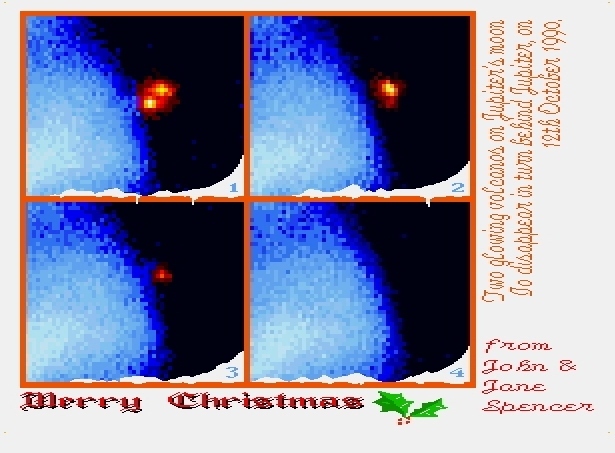 John and Jane's 1996 Xmas card (79K JPEG). Imagine 4.0 rendering of Io, Europa, and Ganymede, with Jupiter out the window. The pine branches are rendered needle-by-needle, which proved more realistic and less memory intensive than making them with brush maps. The maps for the celestial bodies are accurate maps based on Voyager images. John and Jane's 1995 Christmas Card (121K JPEG). Imagine 4.0 rendering: note the soft shadows. 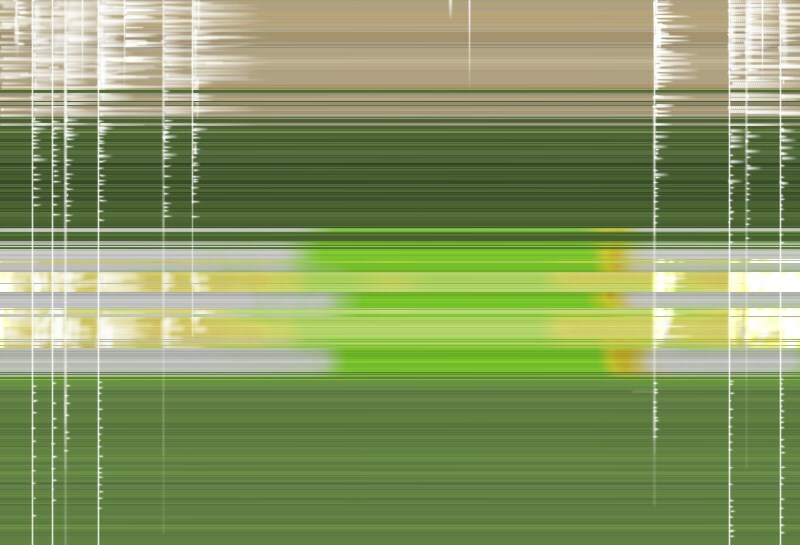 The subtle streaking on the apple (maybe a bit too subtle) uses the "IRIS" texture. 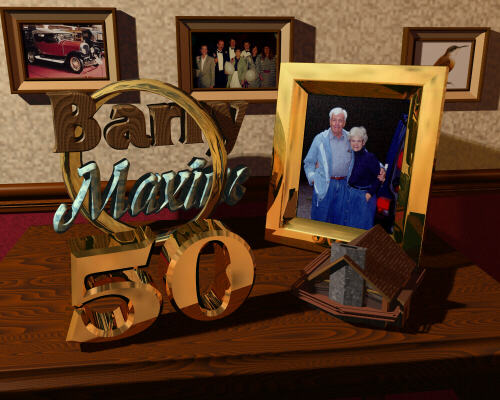 For the 50th Anniversary of my in-laws (178K JPEG). Imagine 4.0 rendering. Virtual silverwork: a concha belt (37K JPEG). The design has no symbolic meaning whatsoever. Imagine rendering. 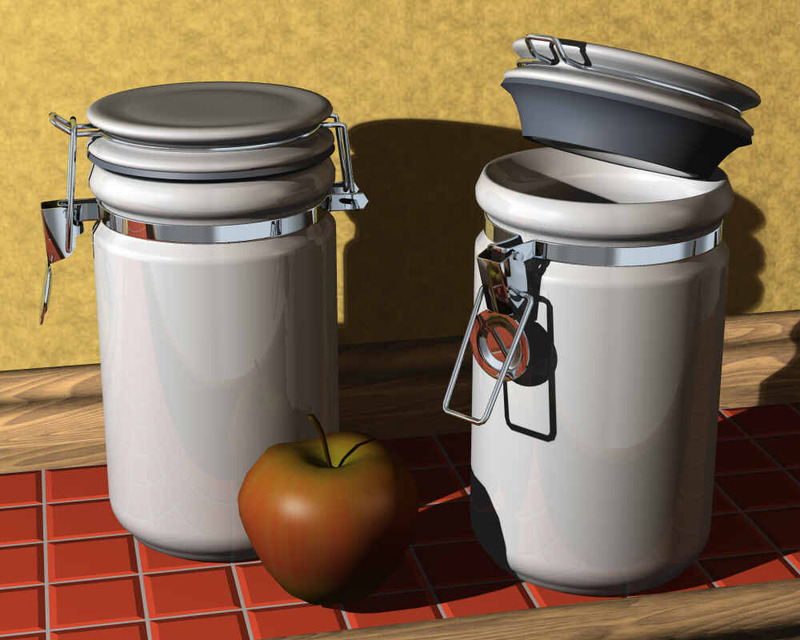 An attempt to model a real-world object as realistically as possible. The jar was a wedding present from Pui Hin and Sam Rhoads, so if either of you stop by, thanks! Note the recycled apple from the Xmas 1995 image. (66K JPEG). Imagine rendering. 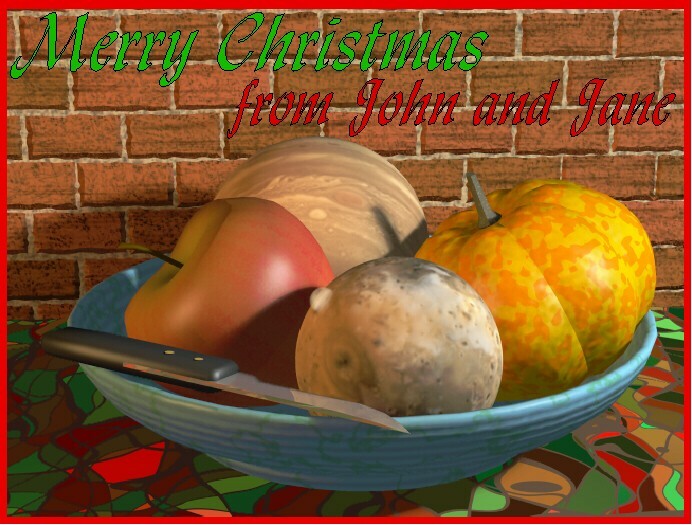 John and Jane's 1993 Christmas Card. Imagine 3.0 rendering. Also incorporates our 1992 Christmas card. 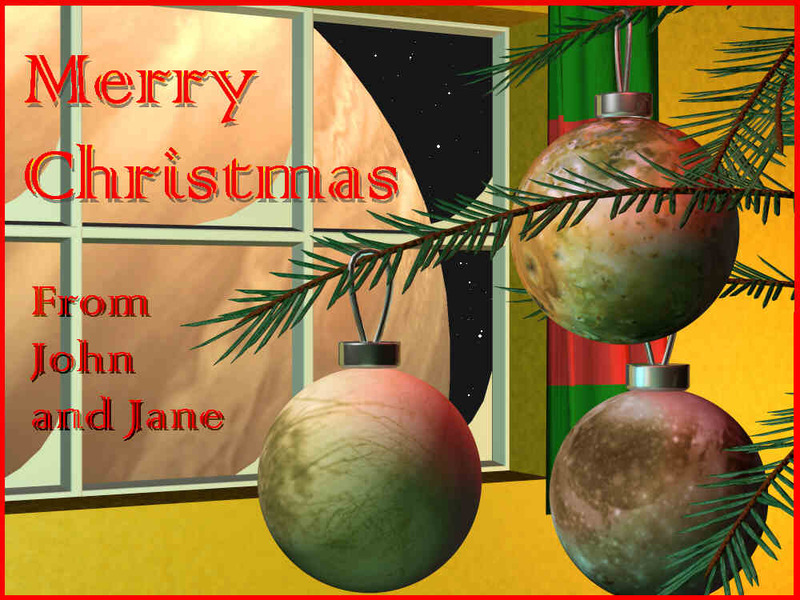 John and Jane's 1990 Christmas Card. Deluxe Paint drawing using colorized digital data from the ProtoCAM infrared camera on the NASA Infrared Telescope- I probably used PBMPLUS to convert from FITS to Amiga image format. The original image is available here. Jane did a further and even more complex transformation of the data, converting the upper-left image into embroidery, pixel-by-pixel.